Marshall Avenue and Monroe Avenue, Memphis. Photo: Chris Porter for Downtown Memphis Commission. Around the start of this decade, Memphis’s public experiments were making its streets maybe the most interesting in the United States. 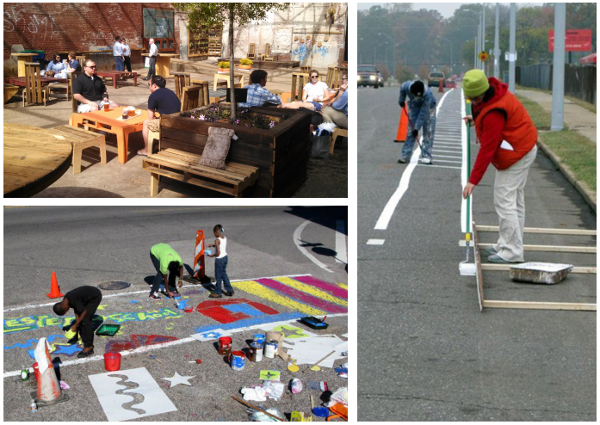 In 2010, a business district organized a live weekend demonstration of a handmade protected bike lane and revitalized commercial block. 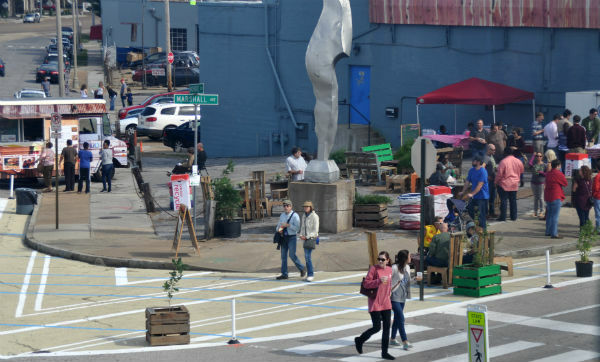 That sprouted into “MEMFix,” a rolling festival of street redesigns that did similar multi-day reorganizations of public space in spots around the city. 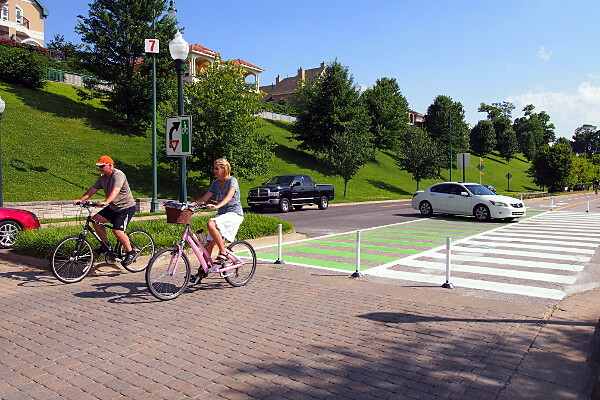 And in 2014 the city ran a one-year trial that converted half of an expressway along the Mississippi to a walking-biking path. Photos from the MEMfix Manual. 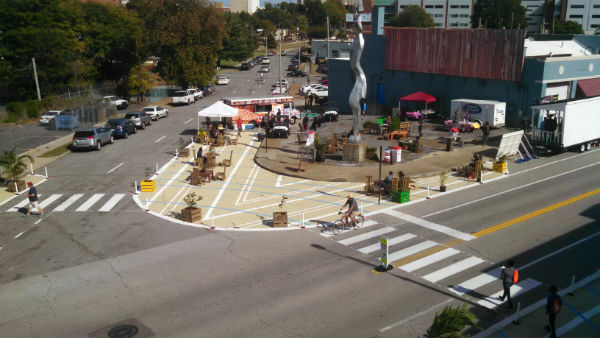 It’s taken a few years, but Memphians’ hands-on experimentation with their streets is starting to pay off in permanent improvements. 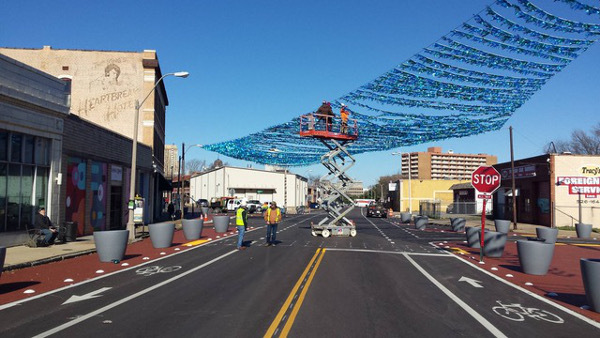 Workers are putting finishing touches on a round of changes to Memphis streets called “interim design.” The most spectacular is at the corner of Marshall and Monroe avenues, where the Memphis Medical District Collaborative and Memphis Downtown Commission co-funded a permanent set of streetscape changes based on the earlier MEMFix demonstration at the same corner. 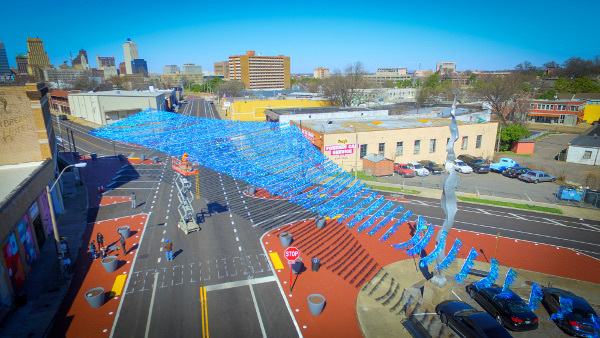 Tying the intersection together is an eye-catching kite-shaped fringe designed by Memphis artist Cat Peña, inspired by the intersection’s history in the 1950s and 1960s. 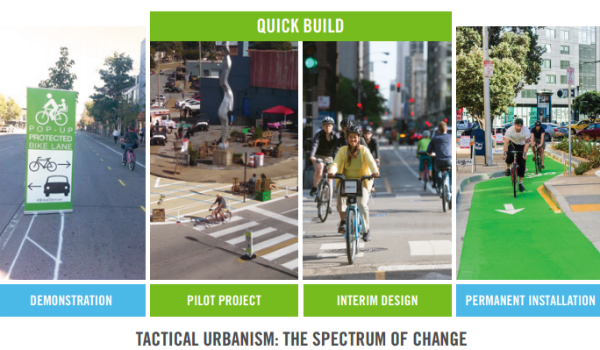 On the streets themselves, Ashworth and his colleagues added epoxy gravel, ceramic traffic buttons as lane markers, large planters to set off pedestrian space and shorten the crosswalks, benches, trash cans, bicycle racks and a public bike fix-it station on the corner. “These improvements will probably last about five to eight years, and hopefully by that time the city will have decided to make some of them permanent by moving the curbs,” he said. In the meantime, he said, this interim design will let the city test how people use the space — including collision data. If any aspects turn out to be unsafe, they’ll be cheap to correct in time for the permanent version. 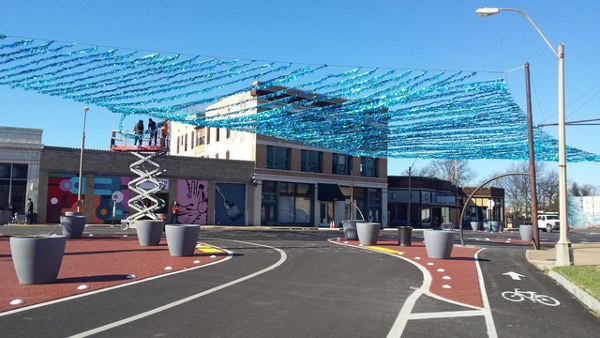 Penelope Huston, vice president for marketing at the Downtown Memphis Commission, said they were enthusiastic backers of the Edge District redesign. Her group provided all the necessary support for Peña’s public art. “Great things are going on in the Edge,” she said. Will Memphis Rise to the Transit Challenge?